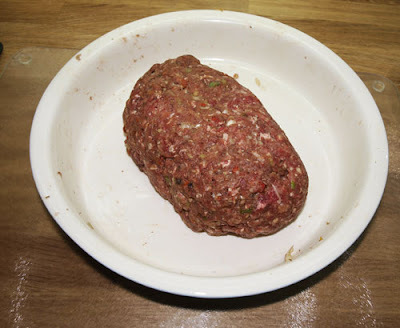 I bought some lovely beef mince from Kilnford Barns Farm shop last time I was there. I also picked out Tamasin Day-Lewis's book Supper for a Song when the mobile library came round and there is a lovely recipe for Italian meat loaf and at the bottom of the page a little note about using the left over mixture to make meatballs, pushing a knob of mozzarella into the centre of each. I only used the recipe as a guide so it is not as described in Tamasin's book. Mixed dried herbs or fresh herbs, whatever you have available. Chop the bread, olives and garlic in the food processor. Add the mince, the egg and the cheese. Season generously with salt and pepper and mix again until it is all combined. You might have to do this in two goes. Make half the mixture into walnut sized meatballs and form the other half into a meatloaf. You can brown the meatballs in a frying pan, but I like to put some olive oil in a roasting tin and put them in the oven at 180C for about 15 minutes, they brown all over and don't tend to burn. Put the meatloaf in at the same time and after the 15 minutes, turn the heat down to 160C and cook for another 20 minutes. The meatballs in tomato sauce (any basic italian tomato sauce recipe will do) were delicious, served with tagliatelle. The meatloaf, I served with nice gravy vegetables and baked potatoes. Sorry the photos aren't that great and I don't have a cooked one of the meatloaf, blame it on greed - hee hee! 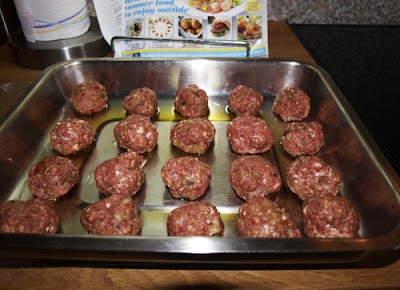 Ooh I love the idea of stuffing the meatballs with mozzarella. Oh good lord those meatballs are simply divine! I love them stuffed like that. A must make for me! I can imagine the addition of the mozzarella in the middle is heavenly! I particularly like making two meals at the same time like that - genius. 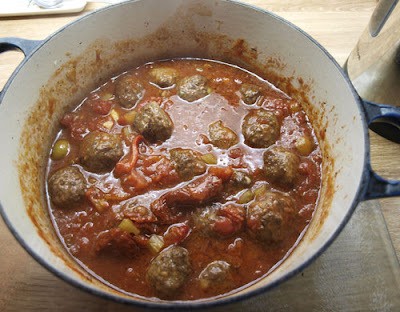 Meatballs make a change from our weekly staple, spag bol, too! You had me at meatballs and cheese!